Why do we get dark eye circles? 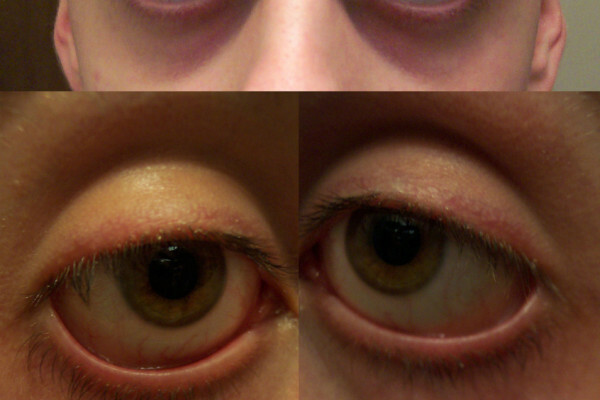 Why do we get dark circles around our eyes? Is it due to lack of sleep? Stephen - Baggy eyes and dark rings under the eyes - well, they're caused by the same cause. They are the result of body fluid problems that appear as darkness or as puffiness. Now first of all, the bags may occur when fluid accumulates in the area under the eyes and this is where the skin is thinner than anywhere else on the body. With advancing age and perhaps with the assistance of hereditary factors, the puffiness may become more prominent or even permanent. This is because the skin gradually loses its elasticity and may begin to sag and gravity doesn't help this either. Now, what appears as dark or blue-black tint, the circles around the eyes, is actually blood passing through the veins which are located just below the surface of the skin. Again, the skin is very thin. Furthermore, these circles may be darker when the eyes are tired and dark circles under the eyes often occur in women during menstruation or during pregnancy. There are other factors too besides age in this. Specific hereditary conditions, reactions to cortisone, allergic reactions to cosmetics, tobacco smoke, and air pollution. All of these can aggravate the situation causing either bagginess or dark circles under the eyes. Sleeping on the stomach can also cause both baggy eyes and dark circles under the eyes because again of gravity, and that's my answer! Diana - Blood vessels getting bigger around your eyes can make the skin there look darker and we think that when someone becomes more tired, their body is forced to produce more cortisol to keep them awake. When this happens, the blood volume in the body increases and then you get blood vessels enlarging to cope with the extra volume. The smaller veins under one's eye are likely to change more visibly under the thin layer of skin and larger ones under thick skin. Previous Why do I see two reflections? Next What happens to the signal if you fly past base stations quickly? Is there any benefit of having "power naps"?